Cash is almost always the most practical gift you can get somebody. I have trouble not feeling that it's too crass, though. Here's one possible solution. Microplace, my favorite microcredit site, recently introduced a Gift feature where you can give an investment to somebody else. You pay the money, it goes to the developing world as a loan, and the interest and eventual repayment go to your gift recipient. Everybody wins! This makes the most sense when you know somebody will need the money more later than they do now; it's a nice way to put the money "in transit" to them - and it does some good on the way. For instance, my sister is facing a gap in her income for maternity leave this spring; I chose a gift that would mature then. It was a perfect solution! Future students are other obvious recipients. Seasonally employed people... people planning an upcoming major trip... etc. Note that I'm speaking here of my preference strictly for Oracle-hosting purposes, and that everything I say about "Linux" really applies to all POSIX-based systems (like Solaris, which I started on as a DBA). 1. Oracle releases patches, new versions, and sometimes security updates for Linux significantly before they are available for Windows - there's usually about a two month lag for Windows (one month for Critical Patch Updates). 2. Our Windows servers have crashed or locked up occasionally, and very frequently require reboots for patch installation. Oracle itself stays up very nicely, but Oracle can't keep running on a machine that is down. This hasn't been a problem for me on Linux. 4. Thanks to the Windows Registry, cleanly removing an installation of Oracle from Windows is tricky and tedious. The Oracle Installer has gotten better at this since version 10g, though. 5. Better tools. Linux find is infinitely better than any native Windows search tool. It can take you minutes on Windows to track down what Linux which tells you in an instant. Also, Oracle uses and generates plenty of plain-text files, and Linux comes with better tools for handling text files - good text editors (unlike Notepad), shell commands like head, tail, grep, etc. You can try to catch Windows up by installing Geanie, Cygwin, Google Desktop, etc. on a Windows machine, but it's better not to have to (especially since Cygwin installation is not completely newbie-friendly). 2. Quest's TOAD is only available for Windows, and it is an infamously useful tool. It doesn't need to be on the database server, though, just on a machine that can connect to the database. Also, Oracle's free sqldeveloper is one among several viable alternatives; it will probably never catch up to TOAD completely, but it's good for the bulk of what most people use TOAD for. In general, however, I should emphasis that Oracle's ancient boast of running on everything really is true. As a DBA, I prefer Linux for the reasons listed above, but to my database users, it's absolutely irrelevant (downtime aside). I could move my production databases to a different OS overnight, and tomorrow, my users would have no idea that there had been a change. Joseph Lisee, author of the upcoming Python submarine robot PyCon talk, left a comment on my last post. I think he was a little shy about me highlighting him. I'm sorry, Joseph. You really left me no choice. Completely Unfounded Rumors About "An Underwater Python: Tortuga the Python Powered Robot"
Roll 1d6 for each hour spent in the Atlanta Hyatt bar. 1. Joseph will announce the release of asimov.py, a pure-Python implementation of the Three Laws of Robotics. 3. Jozeph 'az been practeeseeng 'eez reedeeculous Jacques Cousteau accent for months and weel uze eet to deeleever zee eentire talk. 4. Several minutes into the presentation, Tortuga will overpower Joseph, throw him from the stage, and announce that humankind is obsolete and has been deprecated. 5. Attendees will be asked to pour out a libation to Poseidon. Any caffeinated beverage may be used. 6. There will be a sprint to construct a tall, dapper companion to Tortuga for communication and protocol purposes. * - No, Tortuga won't be physically present at PyCon. It's not that portable. Believe me, the program committee asked! P. S. Blogger, don't you know what an <ol> is? You know, like an <ul> with numbers. When I look over the PyCon 2010 talk list, I'd like to be at about half of them (a physical impossibility, until I master self-multiplexing). Still, these are the ones that I'll move heaven and earth to be at. What about you - what are your favorites? I'm hopeful that this can really move Jython from my "stuff I think is cool" box to my "stuff I use every day" box. This is going to cover development environments and tools for debugging and profiling... pretty much a necessity in the .NET world. I also hope to use the video of this talk in the future in talking to the hordes of programmers around here who live and breathe Visual Studio. Silverlight is way too cool to leave to the C# kids. As a local group-leader type geek, I'd love to start some of these Hack Nights. There were so many proposals for descriptions of non-relational databases - but this one really stands out because it looks at the huge picture, classifying databases by their broad category and highlighting what makes each category beneficial for particular purposes. I confess - I've fallen behind the TurboGears world lately. Nobody's demanded a dynamic web app of me for a while, and TG has moved too fast for me to keep track of it. When last I was involved, Sprox was just emerging. I hope this talk will help me catch up. Revisioned databases are an interesting concept, and seeing how one was actually developed should warm my datageek heart. Gathering data from disparate, chaotic sources is a big part of pretty much everybody's life. I'm eager for any new insights. because, deep down inside, people everywhere are the same; we all want to be loved, and Python-powered robot submarines. The official Oracle Data Guard docs are, of course, the most complete and accurate source of information about setting up Data Guard. They're not very easy to use, though. They don't provide a walk-through of the entire process, for example, instead branching the discussion at every possible decision point. I just fought my way through the process, with help from Chris Ruel of Perpetual Technologies, and thought I'd record my steps for the benefit of humankind. OK, that's not true - it's actually because the Internet is the only place I can leave myself notes and be certain to find them again later. For the past few weeks, I haven't been able to access python.org or any of its pages through a proxy server. My workplace has one standard proxy server, and I also use a personal machine as a SOCKS proxy for an SSH tunnel - and both of them have been getting name resolution errors for all python.org sites. I haven't seen it for any other sites, or when using no proxy. Does anybody know what's going on? Is there something about python.org that would make name resolution work differently for it? We are so not the only offenders in this department. It's everywhere, it's endemic. At website after website, we're asked to provide information of no apparent relevance to the sites' purposes. It's so easy to throw field after field into a data collection form; templates are provided with every conceivable field already in place; and - well, why not? Isn't more data better? No. No, it's not. Excess data takes time, clutters databases, obscures important data, increases risks of data leakage. In interpersonal interactions, we always have the option of asking "Why do you need to know that? ", or just giving people that funny look that tells them they're going out of bounds. On paper forms, we can leave fields blank. Automated forms with field validation cut those safeguards off and open the door to compulsive collection syndrome. The one defense people do have against intrusive electronic forms - lying - ruins data quality, and false data is much worse than no data at all. We need a ethos of restraint in data collection, of always asking, "Why am I collecting this field?" Data collection needs to be seen as something that is not pure good, but something that has a cost to weigh against the benefit. Not collecting data is often the responsible choice, and we need to teach each other that. Right now, we're in the fun part - going through the proposed talks and yelling, "Oooh! Ooooh! I want that one!" Just looking through the proposed talks is a great Python education all by itself - you find out about useful packages and techniques you'd never known were out there. My reStructuredText slides are at catherinedevlin.pythoneers.com, down at the bottom of the page. Thanks to everybody who attended and gave great feedback! I arrived Friday morning this time and spent a good chunk of the day at the Hackathon, working with Mark Borgerding on his idea for a new educational game for Childsplay. We made some good progress, especially since we were both 100% newbies to pygame! I enjoyed myself and learned a thing or two. Hopefully we'll be able to finish the game up remotely over the next several weeks. Next came an impromptu lightning talk session (I looooove lightning talks) where I gave an extremely badly-organized (but well-received) glimpse at sqlpython. I helped Todd Trichler from Oracle Technology Network with his demonstration of Oracle's free offerings. We had a good group, and the next morning Todd gave away his ENORMOUS box of Oracle software in about an hour. The hallway track was, as usual, excellent. William McVey and Eric Floehr used the PyOhio table to stir up interest in CincyPy and Central Ohio Pythonistas, and Monday's inaugural COPy meeting had 27 attendees! Score! I enjoyed talking with people so much that I found myself on the verge of going hoarse just 90 minutes before my talk. Eek! I had a great time. Congratulations and thank you to the OLF organizers and sponsors. Once a year, you make Ohio feel like anything but a technology backwater! The Ohio LinuxFest fun starts tomorrow! Here are the Python-related activities there that I know of. Of the Friday hackathon projects, I believe that schoolsplay and sendoff are Python-based. PyOhio booth - all day Saturday (though not always staffed). All Python groups should take advantage of it shamelessly - bring your literature! - and anybody who wants to hang around there and have Python-related conversations with people, that's fantastic. And, of course, don't forget Oracle's event at OLF. 1. No matter what rights your primary account has, you need to run easy_install from a Run as Administrator window - otherwise, easy_install runs in a separate window which pops up, flashes some feedback at you for a microsecond or so, then disappears, leaving you with absolutely no record of whether the install works and why. There doesn't seem to be any way to log the results to a file. 2. After installing any module that is deployed as an .egg into site-packages, you need to go and edit its permissions manually to give your account read privileges on the egg. (Giving your account privileges on the whole site-packages directory does not help.) Until you do, import newmodule will fail with ImportError: no module named newmodule on your account - but will succeed when run from a Run as Administrator window. This is bad news. I fought my way through because I'm a dedicated Pythonista; how many Vista-using Py-curious are going to give up on Python because module installation now requires such hacks? Enthought has produced a wonderful tool for getting into reStructuredText: a side-by-side WYSIWYG rST editor. Getting it installed, however, just about killed me. Here are the steps I finally puzzled out for Ubuntu 9.04. Miss any steps - or even change the order - and you'll get error messages that don't help even slightly. [EDIT] If you're not on 9.04, or you just want to be on the safe side, it doesn't hurt to sudo apt-get install python-dev python-qt4 at the beginning of the whole process. ... sudo chmod +x /usr/local/bin/rsted, and live happily ever after. Obviously, you can't query BLOBs in a command-line SQL tool. Unless, of course, that tool is sqlpython. Bwa ha ha ha. It's official - I'm on the schedule! Introduction to reStructuredText, a simple single-source format that can generate documents in HTML, PDF, .odt, and many other formats. I also see tasty-looking talks on "Python for Linux System Administration", a "Sysadmins' Rosetta Stone" talk that should help me port my Ubuntu skills to Red Hat, and gobs more - plus the Diversity in Open Source workshop. This will be a great year! Why do we Americans continue to carry around drab $1 bills, struggling to cram mushy, wrinkled paper into vending machine readers, when we could carry gleaming, clinking, golden doubloons? Admire the gleam and the weight. This is the proper sensory experience for money! I just found out you can buy boxes of 250 coins directly from the mint. Granted, there's $5 shipping, so you're paying $255 to get $250, but your credit card kickback should cover that. Then you can eschew that lame ATM for months! Let's face it, you only use cash for little purchases these days anyway. Make every cash transaction enjoyable! When you receive your coins, feel free to run your hands through them several times, purring, "Arrrrrr! Thar's treasure for ye, me mateys!" Do NOT, however, bury them in a sturdy wooden chest and draw a map with a dotted line and an X. I know it's tempting! I want to do it, too! But the point is to get more of these beauties into circulation. My employer-mandated Vista machine has gone almost unused for months because of an infuriating quirk in Vista's command-prompt operation. I've come as close to completely forgetting how to use Windows as I've ever been. Giles Thomas (of Resolver Systems) saved me. Thus, I was unable to install cx_Oracle, and had to turn to my trusty Ubuntu machine for absolutely every pyOraGeekish task. Giles blogged a lifesaver workaround. If you can run the cmd window as Administrator in the first place, you are entrusted with the awesome power and responsibility of being allowed to view your own error messages. So, now I can blow the dust off my Vista machine. Wow, controlling the font size of a cmd window is absolutely as primitive as it was in Windows 3.1. Giles, got a workaround for this, too? It's not official yet - so you can't find it at the Ohio LinuxFest website - but it looks like Oracle will be a sponsor and exhibitor this year. They're planning to do an Oracle-on-Linux installfest. If you'd like to get your first taste of Oracle on Linux, sign up for LinuxFest (it's free) and prepare to have a blast. If you're already pretty good at Oracle-on-Linux and would like to help others get started, send me email! I hope to gather a small group of volunteers to help out at the installfest. That was called a "bug report". It was not actually a request for a condescending message about how I can still rent a car by navigating the website in a different way. I knew that. I took the time to write up detailed instructions for reproducing the bug as a professional courtesy to your developers. Unfortunately, they will never see my message, since your customer service is managed strictly from a "deal with nuisance customers" point of view. Looks like I wasted a couple seconds of your time as well as several minutes of my own. RESOLVED: If I ever work on a project large enough to have a customer service department separate from development, I will insist upon bridging this gap. I will make sure customer service has the access, knowledge, and encouragement to communicate constantly with me. I will regard customer service as a valuable conduit for end-user feedback rather than a distant, uninteresting group of non-colleagues. Instrumenting your code - whether with a PL/SQL package like Quest Error Manager as Steven Feuerstein suggests, Python's logging module, or whatever - is an important part of writing good code. I don't. Not very often, anyway. When I do, I often delete the logging calls as soon as the code is more or less working. The biggest reason is the ugliness. EWWWWWW! That is ugly! It completely disrupts the comfortable reading of the code. It buries the actual purpose and actions of the function under a steaming heap of chatter. It offends everything that I value in beauty and readability. What to do? One solution might be a code editor that would toggle the visibility of all logging calls in a program. You could leave them invisible most of the time, and only look at the logging statements when you have a specific reason to. I can see two problems with that, though. The logging calls themselves could get out of synch with the functioning code. This could be partially addressed by having logging calls become visible automatically whenever code adjacent to them is changed. This would create code which is readable and beautiful in my editor, but ugly when somebody else tries to read it. Perhaps if we cooked up a convention whereby a header comment could define the suggested hiding of logging calls for each program, and most editors could be trained to recognize and respect these suggestions? I don't have the answer for this. I'd love to hear ideas. EDIT: Gary Bernhardt tweets, "Anything that you want your editor to to be able to hide (comments, setters/getters, logging) shouldn't exist". An interesting idea... how to eliminate logging? A good logging decorator could log arguments, return values, and error messages to any decorated function - and that level of information could suffice, if the functions are very fine-grained. Having to write fine-grained functions is the sort of constraint that might improve programming style, too, much the way unit testing demands well-defined functions. I think I'll try this philosophy and see if I can make it work. It's not much help for the PL/SQL side of things, though. I'm trying to imagine if there's some way to make an analog to Python's decorators in PL/SQL. Clearly, it's somebody's responsibility to create a Hall of Fame for database-related comic strips. I may as well start gethering them here. William McVey prepared slides for his Sunday PyOhio presentation using reStructuredText and rst2s5, but he wasn't satisfied with S5's presentation quality. He tried rst2odp to generate an OpenOffice Impress document instead, but it failed him. So he convened a Saturday night sprint on rst2odp at PyOhio. Working past midnight, a small team fixed the rst2odp flaws. William regenerated his slides and presented successfully on Sunday. Todd Trichler from OTN is beginning his half of our presentation while I post... my half's materials are here. Things are really coming together! PyOhio registration is open. 38 people have signed up in just over a day! The talk schedule is up. 25 talks, my goodness. Oracle Technology Network and Intellovations have stepped forward as sponsors. Oracle is also sending Todd Trichler to cooperate with me on a two-hour tutorial on Oracle/Python/Linux. I'm enjoying the preparations so far - I think you'll like it if you have any interest in databases. There's a whole class of programs called "rules engines". The idea is to remove the details of a process from the hard-code of the program, store them externally, and view/modify them easily. The engine then converts the rules, stored in some sort of custom format, back into an executable form at runtime. In my experience, Python is an effective rule engine. Thanks to Python's readability, you can store business rules as snippets of Python code - in textfiles, a database table, or wherever you prefer - and business users should be able to read them comfortably. After that, a very lightweight Python program can load the rules and the relevant data and use exec() or eval() to apply the rules to it. Rules must be documented. Letting documentation get out of synch with implemented rules is very bad. My first take on the problem was a large hard-coded PL/SQL procedure. What a nightmare! Later, I rewrote the rules as snippets of Python. Each rule is stored a database table along with the dates it takes effect and expires, the person authorizing the rule, and a justification. This readable, self-documenting set of rules can also answer questions like, "Why did things change since last month?". I suppose it wouldn't be too hard to put the function definitions themselves in among the rules, then include locals() in with data, as long as execution order is controlled (easily done by putting execution_order columns in the rules tables). It hasn't been necessary for my project. I suppose I could try writing a sample rules-engine implementation in simple, general terms, that people could crib from for their own "rules engine" applications. I wonder if that would be helpful, or if just the general idea is enough guidance. As if I need a new ambition, I've got an itch to create and teach a course called "Computer Programming for Secretaries". Since I got into IT via the secretarial pool, I think I'm the perfect one to do it. To outsiders, programming has this horribly intimidating aura. You've got enterprisey Software Architects trying to sound professional, academic Computer Scientists telling you that you're oversimplifying the problem, fearsome Hacker Gods strutting their skillz. Lots of people want to make sure you know how smart they are, and that nothing could happen without their planet-sized brains. If you want to launch satellites into space, you need to invest your life in the field and be part of a large, well-funded institution. Yes, you can have lots of fun with model rocketry, but you're just playing. You're not actually going to get anything into orbit. My friend James is a professional chef. Everything he makes involves a bunch of French words, ingredients I've never heard of, and turns out eyes-roll-back delicious. I don't have the ambition to invest the time and effort to cook that well... but I can still roast a turkey. That's what programming is like, especially dynamic language programming. With a lot of skill, you can work miracles - but with a little skill, you can work little miracles. You don't need to go in for the whole hog. That's what I'd like a class to address. There are programming books aimed at kids, but none that I know of aimed at adult business users. There are people who could write themselves small, useful programs, but who will flee in well-justified terror if you start talking about overriding import hooks. There are people spending hours cutting-and-pasting from one file to another because they don't know how to write a six-line script. 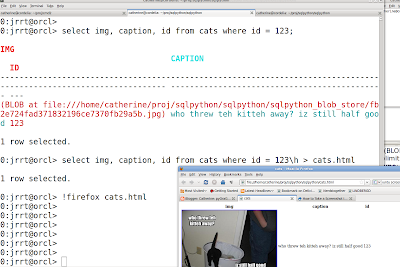 There are people could replace some of their daily tedium with just a little dose of Python. There is Resolver One, which is a fantastic way to integrate tiny dashes of Python with everyday spreadsheet work, but it's being used by thousands instead of by millions. So... yeah. What should such a class include? More importantly, once I'm ready to teach such a class, where do I teach it? Given a choice between spending an hour doing a task manually, or spending three hours writing a program to do it automatically... a geek will write the program, every single time. And, if not given the choice, if explicitly ordered to do the job manually, we'll disobey and write the program anyway. I've heard it said that a good geek is lazy, but I think it's more precise to say that a geek dreads boredom above all else. We'll move mountains to accomplish a task, as long as it's interesting. This is not nearly as crazy as it sounds, because after we've "finished" a task, without fail, the requestor will return and say, "I know I said that would just be a one-time change, but...", or, "Actually, it turns out we don't need A B C D, we need A B Q D C", or whatever. You will reuse that program, no matter what they say; never throw it away! Pardon, oh Citizens of the World who read this, while I go regional for a moment and speak as a Dayton-area resident on news almost certainly irrelevant to you. "the high availability of a skilled work force"
The funny thing about the first reason is... NCR doesn't hire people. (Their manufacturing plants may hire, but I'm speaking of their HQ here in Dayton). Since I came to the Dayton area, I've had IT friends in NCR and have tried to keep up with them. The news from them has always been the same: "We just went through another round of downsizing. We keep wondering when our turn will come." For a company in continual contraction, the benefit of a larger pool of people to not hire seems... um, not clear. That leaves shorter plane flights for those who fly to Europe - seems a strange reason to move 1,300 people - and a large amount of cash. Many people think Ohio should have tried to outbid Georgia, but that would have to come at the expense of companies that don't threaten relocation - and it begins to blur the line between "private company" and "state-funded entity", anyway. Moving itself, of course, gets rid of those employees who choose not to relocate. I predict that most Ohioans who choose not to move with NCR will not be replaced; the company will use the natural contraction in place of one of its periodic downsizings. I've got an article in this month's Python Magazine: PyOhio: Planning and Running a Regional Python Miniconference. I try to cover some of the stuff we learned in the course of doing the first PyOhio, for the benefit of people considering staging similar conferences of their own. I feel a little silly impersonating an expert on the topic, since I'm near the beginning of a learning process that never ends - but in the open-source world, it's not being the ultimate guru that's important, it's taking the time to share whatever you can. Python Magazine is a great publication, by the way - with all the good stuff about Python on the net, you might wonder what's the point of buying a magazine, but their articles are very well-chosen and there's a real advantage to being able to read it away from the computer. The tools are separate from the mainstream of version control in software development - you're learning quirky specialty tools instead of widely-known industry standards. They lack some of the modern capabilities of distributed version control. We're better off using standard software development VC. But, of course, those tools are meant for text files, so there needs to be a handy way to get this stuff from DDL inside the database to version-controlled text files. If you don't want all the DDL, you can limit the dump using the same arguments the ls command takes. bzr: ERROR: Already a branch: ".". PyCon early-bird registration deadline is TOMORROW (Saturday)! No time to lose - go register! Most Open Spaces are not scheduled until the very day they are held, and that's good. Some are done with some advance planning, though, and that's good too. Doug Hellman is already preparing a "Writing about Python" open-space session at PyCon; I'm eager to take part. If you're not familiar with conferences like PyCon, you may not realize that the formal schedule, goodie-packed though it is, is not the whole story by a long shot. People use the Open Spaces for a huge variety of things; last year, for instance, I got a lot out of a group organizers' freeform open space discussion, and even more out of the now-famous "Teach Me Twisted" session. If you think the published schedule leaves you in fits of indecision, wait until you see the Open Space board. There's a sort of joyful despair in seeing that you would need three months of PyCon to take part in all the PyCon you want. Well, not really, but it did get your attention. This is a really interesting New York Times article about VaR ("Value at Risk"), a mathematical tool. Over-reliance on this tool was arguably the reason the world's financial experts and geniuses spent the last several years acting like morons. This paragraph jumped out at me. I thought this was a fascinating summary of open-source advantages: prestige, benefiting from community-contributed enhancements, creating a standard, all without the effort and expense of attempting to market a proprietary technology. OK, so it's not really a feather in Open Source's cap, seeing as the economy did end up wrecking over it 'n all, but it does demonstrate the power of openness to popularize a tool. Open-sourcing a tool can make it very popular, but it's up to us not to make a tool into a god. You want an awesome badge like this for your blog, right? You can choose from a variety of badges at the publicizing PyCon site. PyCon depends on the user community (that's you) to spread the word. Bringing in a bigger and broader community is how PyCon keeps getting more exciting. Anyway, even if you are certain you can't attend PyCon, it's worth it to browse the list of accepted PyCon talks - it's a great window into some of the exciting things going on in Python-land. It's already helped me learn about several useful packages and ideas. Today my employer benefited through me, but almost despite me. We're facing an exhausting slog through yet another incarnation of the Air Force's process for getting permission to continue to operate an IT system. My (Air Force) boss had heard somehow that Mark, one of my fellow employees at Intellitech, was shepherding some projects through this process, and asked if he'd be willing to give some advice. Mark came and spent a couple hours giving some desperately needed information, despite being warned that my boss has no prospects of funding to take on additional contracting help. Everyone there was enormously grateful, because living, breathing survivors of the process are almost unheard of, and the available training material is of very little use. What's more, my boss had made a last-minute impromptu invitation to a friend whose project is also facing the process; she was just as happy to attend, and just might have the funding for some help. And everybody there is going to spread the word that they now know a source of much-needed information on this process. The problem? I was passive. I hadn't thought to suggest to my boss to tap Mark's experience; good thing he knew about it and thought to ask. I hadn't thought to suggest inviting others to the meeting, either; again, credit to my boss. I really need to be more alert to this sort of thing. The other problem? If Intellitech does end up with more work thanks to today, it's the kind of hellishly bureaucratic work that makes you want to chew your leg off to escape. Great for the company bottom line, but a blasphemous waste of a living human soul.